"I have to do this." I thought as I unscrunched my face and tried to camouflage my disgust. Deep breath. Here we go. "Welcome to Walmart" said the greater. I managed to grunt and force a half smile, making a bee line towards the kids department. After weeks of looking at thrift shops, we were still without the serious snow gear that our 5 year old daughter needed to survive the cold, hard winter here in the mountains of Colorado. We got three feet of snow earlier this week (yeah, in October), which made for awesome sledding over our two days off from school. Unfortunately, the two older kids had to take turns using the snow suit and boots (lucky for us they're the same size). Today when we dug out I made the decision to break the Compact and get Macy the gear she needed, rather than hoping it might come to me serendipitously. Walmart is probably one of my least favorite places on earth for a variety of reasons, but it's the only store in our little mountain town. There was a time I could brag that I hadn't set foot in a Walmart in several years. Not that boycotting Walmart somehow made up for the love affair I had with Target. But that's neither here nor there. At any rate, we picked out gloves and a snow suit, then headed to the shoe department to find some snow boots. Out of her size, darn. We took a spin through fabric. Nothing too fabulous. Any kitchen gadgets I "need"? No. My 4 year old spotted the plastic pumpkins for trick-or-treating, "Can we buy those mom?" "Uh, no." I told him in that "Are you smoking crack?" tone. "But why not?" he asked. I think I answered something to the effect of "Because we don't buy cheap plastic crap that you use once and clogs the landfill for ever." Meanwhile I was admiring a glass pumpkin cookie jar / candy dish type thing, thinking how I'd put the kids' candy in it. Ooooh and it's only $5.00! But what am I going to do with it the other 364 days of the year? Why would I possibly need a glass pumpkin? Here I was actually trying to break the Compact in a blaze of glory and all I could get myself to buy was what I originally came for. What I really needed. "Here’s the thing...we still live in the same world we inhabited before The Reformation, and an important part of making really lasting change is developing the capacity to be a little flexible sometimes, and then climb right back onto the wagon." I think I'm starting to get that. "What have we got in there?" I ask my youngest as he paws through a shoe box full of salvaged treasures. Bottle caps - metal and plastic, twist ties, string, molded plastic packaging, a scratched CD. Some of this is ours. Some was left behind by visitors to our home. And still other items were found on the street outside our home. Much of it is trash, not recyclable anywhere. "This is super cool, like a shooter." He holds up the empty shell of his asthma inhaler and demonstrates how such a shooter might work. "Yup," I nod. "A shooter. Do you think that this guy needs a shooter?" I gesture, with my glue gun, to the box - glimmering silver with spray paint obtained from Freecycle. We're building his Halloween costume - an amalgamation of trash with a few recyclables thrown in for effect. A robot. A super cool "trash eating robot" with, of course, "a shooter." I'm pretty sure every robot needs a shooter. I suppose we could have trotted down to the local toy store and shelled out $40 for a new Halloween costume, neatly wrapped in plastic and guaranteed not to rip for a day or so. I suppose that could have been fun. But not as much fun as poring through websites for ideas. As peeking in the recycle bin and emerging with the "O" of excitement when we'd found just the right robot eyes. As debating bat-ear placement. As sewing and glue-gunning together the treasures we'd collected. As inventing a recycle-bat or a trash eating robot with shooters. No, not as much fun as that. 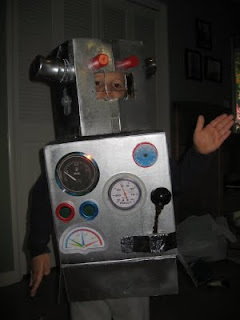 * PS: Upcycle your kids' candy wrappers into these uber cool robots after the big day. 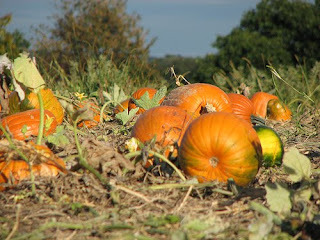 More thoughts on seasonal eating from The Conscious Shopper. I'm having such a hard time with this right now. The eco-geek in me REALLLLLY wants to eat as locally and seasonally as possible, but truth be told, I don't like winter veggies very much here in Chicago. I'm not quite sure how to get around that one small fact, other than canning or freezing, which I am too late to do. Your comment about feeling deprived rings true and hard for me. Any suggestions?? I thought this was a great question, so I wanted to open it up to all of you and get your insights. From a seasonal eating perspective, I am very lucky to live in North Carolina - it only drops below freezing a few times a year so with the help of hoop houses and cold frames, the farmers can grow year round. I'm guessing that the farther north you live, the fewer choices you have in the winter. But if you branch out from the norm, you might discover that more vegetables grow in your area than you think. This year we decided to try a winter CSA, and we've already gotten things I'd never heard of before - still a lot of root vegetables and greens, but more variety than we could find at the farmer's market. You might also try seeking out other varieties of the same type of vegetable. For example, my husband has never been keen on sweet potatoes, but they are a winter staple down here. Last winter, he was eating sweet potatoes grudgingly until we tried a different variety that's available at our farmer's market. It has less of a sweet, carrot-like flavor and more of a potato-like flavor, and my husband definitely preferred it. If you don't like one type of squash, don't assume you dislike all squash. Same with greens and root veggies. What tips do you all have for Jackie? How do you make it through the long winter as a local and seasonal eater? But still I live in California. Very little of my energy comes from the dirty hands of coal. My mountains are intact. It is easy to forget. To push mountaintop removal from my mind. To think of it as someone else's battle. Mountaintop removal, though, is more than that. According to Grist, it is shaping up to be ground zero for Climate Change and renewable energy movements. 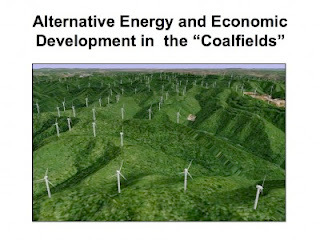 A study recently found that one mountain, Coal River Mountain, could be the site for windmills generating up to 328 megawatts of clean wind energy. That could power 70,000 West Virginia homes, provide permanent jobs and nearly two million in taxes. Residents rallied around the idea of a profitable, long term wind farm. Green jobs vs. the coal industry. 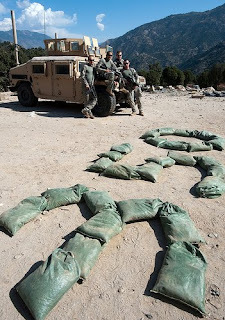 And yet, that mountain is now slated for destruction. On October 24th, people across the planet demanded Climate Action. If we, as a country and as a planet, want to shift from the dead end of fossil fuels to the hope of renewables, now is the time to take a stand. Sign the petition, call the President or email him, email the EPA, write Congress, tell your friends, talk about it on Facebook, tweet about it, blog about it. Just don't forget about it. Because saving Coal River Mountain, ending mountaintop removal is so much more than just someone else's problem. It's all of our problem. * When I called the White House, the operator knew immediately what Coal River Mountain was - which I take to be a good sign. Last year, I attended our local Chili Cook-Off for the first time and about had a heart attack. Not from the heat of the chili or the heat of the day - it was abnormally warm that day - but, from the amount of plastic being consumed. A dizzying, gut-wrenching, heart-breaking amount of plastic! I spilled the chili beans about it here. 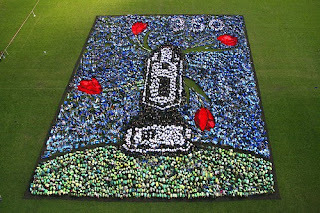 I never did write that letter to the event chair - I am a lazy environmentalist- but, the image of 32,000 styrofoam cups did stick with me. Not to be one to lock myself in my eco-bubble and avoid all contact with the plastic-consuming outside world, I decided to give the chili cook-off another try. The location had changed, along with the weather - this year was abnormally cold - but, the rapacious use of disposables had not. This year I was more prepared for the massive chili plastic consumption - physically, if not mentally. Armed with many layers, my camera, klean kanteen, stainless-steel thermos and to-go ware spoon hubby and I prepared to feast. Waiting in line I presented my thermos at each station and requested to have the chili sample placed in my own container. Last year when I tried this technique with the styrofoam cup I received from the first sample, several stations were less than thrilled with the idea and some flat out refused to reuse the container. This year with my own container, no one batted an eye. In fact, a few commented on my resourcefulness and remarked that I must be a chili cook-off veteran. Yeah, something like that. Drowning in a sea of willy-nilly chili-eating plastic predators I stood with my one reusable container and bumped into the mayor. I commented on his lack of cups. Most of the people around us had a tower-o-foam from all the samples they had sampled. He replied that he had been tossing them as he made the rounds. 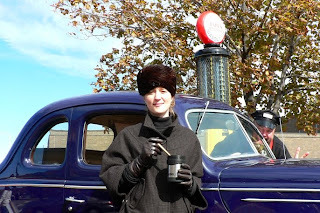 Noting the thermos in my hand and bamboo spoon I was eating from he commented on my sustainability. In a crowd of hundreds, the only person who got it is the mayor. The mayor of city of over 50,000 that does not recycle plastic! A bit ironic, don't you think? The reality is that not everyone shares the same eco-eagerness that you or I do. Or, even the eco-awareness of the rest of our family members. There will be more Chili Cook-offs and more plastic consumed - far more. It can be disheartening and at times overwhelming, but a solitude life hiding in our eco-wonderland called the internet is as bland as some of the bad chili I sampled. 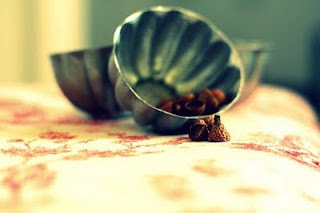 Add some spice to your life! Just because a recipe calls for one ingredient does not mean you cannot substitute another. If you are shy about PDeA, just wear a crazy hat and no one will notice the reusable container you are eating from. Just like no one noticed the crazy guy in the background of my picture! Regular guest poster, Jess, muses on the importance of buying local. Jess blogs at Sweet Eventide. Yesterday I was walking along the main street in my town which is home to many independent businesses. I have several favorites that I visit regularly and one of them had a flyer in the window which I had not noticed before. 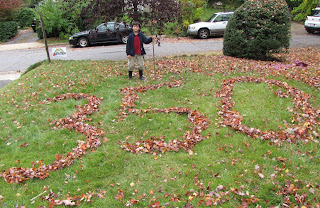 The 3/50 Project is not to be confused with 350.org, and the International Climate Action Day coming tomorrow, October 24th. The flyer caught my attention right away with the question: "What three independently owned businesses would you miss if they disappeared?" This was way too easy for me to answer, as directly across the street, one of my other favorite businesses is in the process of shutting down. The flyer continues, "Stop in. Say hello. Pick up something that brings a smile. Your purchases are what keeps those businesses around." But the big sign in the window across the street makes it all too clear that Good Sage with its lovely offerings is not going to be around much longer. 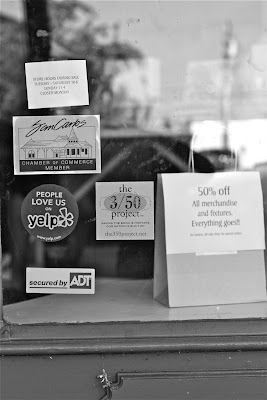 Which brings us to the 50 part: apparently if half of the employed population spent $50 a month in locally owned businesses, it would generate upwards of $42 billion. "How many times," I wondered, "have I wandered into Good Sage and said hello?" Many times. "How many times did I spend $50?" Not many. There is where the hard part comes in. Like many families, I am watching our family's pennies as best as I can. Living on one income in a high-cost-of-living area is a challenge. But Green Bean got me thinking with her post about great ways to spend money. It turns out that spending a little to keep a local business alive is definitely one of the great ways to spend. 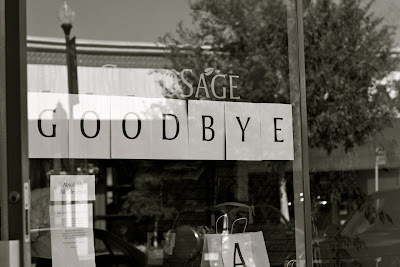 Granted, I loved almost every product in Good Sage, but everything always seemed "out of my budget." So instead I spent almost nothing when a more moderate approach could have worked. Maybe buying a pair of their lovely colored tapers regularly would have helped, even if I couldn't afford one of their gorgeous wool rugs. When I do spend, I am very conscious about it. I sincerely struggle over it and most of our spending is on high-quality food. But somehow giving me a number to focus on makes it easier. Surely I can divert $50 a month to something I believe in so deeply. For example, I haven't purchased books in years upon years. They got filed under "extremely indulgent" in my mind somehow. "Why buy when I have the library?" is a common line of thinking. There is a darling independent bookstore down the street from Good Sage that recently opened its doors. I am now determined to let a few more books into my family's budget. Even if the 3/50 project is too late to help B.K. and Susanne, hopefully it's not too late to help Diane and Lauren. A body shifts next to me and then a small hand touches my forehead. "Mama." He's the only one who calls me that. My littlest. I squeeze my eyes open, taking in the trickle of sunlight through the tent flap and the sleeping forms of my husband and six year old, swaddled in blue sleeping bags. I reach back and hold the soft hand. Checking my watch, I signal him to be quiet and follow me. I don't want to wake my sister's family, sleeping nearby. We climb out of the tent and silently put on our shoes. Tiptoe quiet, we move away from the campsite, the leaves and sticks determined to crunch even under the gentlest step. The harbor lies just on the other side of the road. A blue expanse of boats mottled by sea grass that resembles shredded newspaper. The tide is in. Not a foot print mars the soft dirt path along the marina and toward the estuary. A rabbit, white cotton tail and all, skids past us and into the underbrush. My four year old grins but knows better than to shriek his excitement. Mr. Bunny might have friends. We do indeed spot three more rabbits and a handful of chickadees before rounding the path and settling down on a rock to watch the water, still as glass. Side by side, we marvel as a rare White American Pelican drops into the water and bobs along with the current. I doubt that it is a pelican but my son insists, pointing it out on the laminated bird guide we picked up at the visitor center. He is right. A sea otter lolls about, sleepily rubbing his eyes and ignoring the screeching gulls. My little guy spots the egret first. Stilt legs and darting head, it wades in amongst the reeds, searching for breakfast. A blue heron soars overhead and the snorts of sea lions echo from distant rocks. Two years ago, I read Last Child in the Woods, realized how disconnected we, and especially our children, are from nature and I panicked. I dragged my family on urban hikes and transformed my yard into a pollinators' delight. 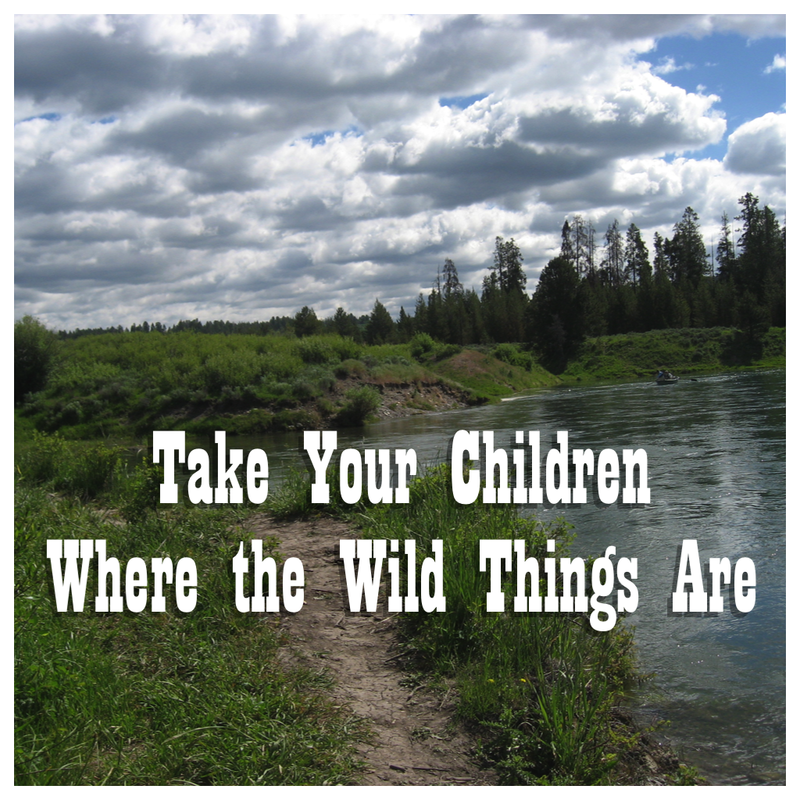 A year later, I bemoaned the ability of us suburbanites to reconnect our children with nature and all its ravaged beauty. I wondered if I should throw in the towel. This past year, a girl who never camped fell in love with the outdoors. With the crackle of a campfire and the slow turn of a roasted marshmallow. With the hours of conversation and the silence. With the stars spread like a blanket overhead and the cool feel of a sleeping bag on my check. With the hoot of an owl at night, the rustle of a raccoon in the brush, with the still egret at dawn. This past year, two boys learned to identify poison oak and banana slugs. They learned what pelicans eat and how to walk without a sound so that you can actually see the animals who left those prints behind. This past year, we camped at the seaside, in the redwoods and on the red dirt of Zion. We invested in a second hand tent and a new ice chest. We unplugged and recharged. We discovered life without TV or iPhones. We found imagination. We found home. The camping season is over for this year. And while the rain has come and washed away our camping dreams until spring, our 2010 calendar is full - of campsite reservations and a summer trip to three national parks. Sitting inside as rain peppered the windows, we realized that, this summer, we learned something about ourselves. That there is magic in a quiet marsh and a few small birds. That fallen sticks can become many things. That kids actually can go through eight pairs of pants in two days. That the phone and computer and television stifle conversation, connection. That silence can be a good thing. And that nothing is as beautiful as where the wild things are. A tribute to seasonal eating from The Conscious Shopper. Making sure I don't burn the pumpkin pie. "Pumpkin season!" we shout, spotting the sea of pumpkins at the far end of the farmers market. My boys dash up and down each row, fingers pointing excitedly. "Look at this one! Oooh, this one is so big. Can we get this one?" We load a hefty white pumpkin into the stroller basket - picturing the grinning ghost we'll carve into its side - then toss in a couple pie pumpkins for good measure. Daydreaming about pumpkin bread and pumpkin pie and pumpkin pancakes, I maneuver the stroller back through the market toward the apple stand. My youngest instantly spots the samples and begins begging for a taste while I check out the apple varieties. What should we try today? Sweet, tart, tangy? I fill a bag with my favorites - tangy jonagolds and sweet pink ladies - and add some tart mutsus for my husband. Piling the apples on top of the pumpkins in the stroller, I take a quick glance at my list and then begin filling my cloth bags with more seasonal bounty. My oldest takes list duty. Onions, check. Potatoes and sweet potatotes, check, check. Last of the year zucchini and squash, got it. We head back to the car loaded up with fruits and vegetables but also with a deep feeling of excitement and gratitude for the season. Over the last two and a half years, my family has been transitioning to a seasonal diet. 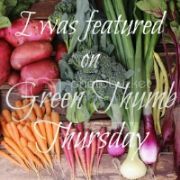 Nowadays, about 80% of our produce comes from the farmers market, and since I haven't yet ventured into food preservation, we know that when we eat that last strawberry in June, we won't get another one until the next May. In this modern age of instant gratification, it might seem like eating seasonally would evoke feelings of deprivation. But I have felt just the opposite. When you can have a strawberry any time you want, you take the strawberry for granted. But when there are only a few short weeks in the year when you get to have a strawberry, suddenly the strawberry becomes precious. Your heart races at the sight of the first strawberry of the year. You buy a whole flat and find yourself eating nothing but strawberries for a few days. And at every visit to the farmers market for the news few weeks, you debate whether or not you've eaten enough strawberries to make it through another year. But it doesn't end with strawberries. Next come the blueberries and the blackberries. And did we miss the one week of the year that we can find peas at the farmers market??? But it's okay because there's corn and watermelon and green beans and cantaloupe and zucchini and grapes. And finally, here are the pumpkins and apples. Pretty soon the farmers market will begin to thin out and our diet will revolve around potatoes and sweet potatoes, collards and kale, but it's okay because winter will end. And strawberry season will be here again! A big welcome back to The Raven, a Booth favorite who retired a few months back. We are happy to have her back for a guest post and hope to hear her voice here from time to time. She posts periodically at her personal blog, The Purloined Letter as well. Inspired by Euell Gibbons Stalking The Wild Asparagus, we recently harvested acorns. Actually, we planned to try foraging for acorns last year, but we were foiled by last fall's unexpected and troubling lack of acorns of all types. David and our son Abraham went out foraging on a beautiful Sunday afternoon. Having no oak trees in our own small yard was not a problem. Our neighborhood was full of acorns ripe for the picking—that is, the picking up off the ground. 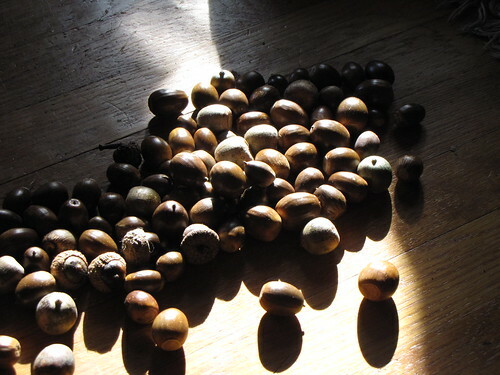 They set out with good intentions to harvest only acorns from white oaks, trees identifiable by their rounded leaves and bearing nuts supposed to be sweeter. But my family members were not the botanists they thought they were and wound up collecting from many oak trees. (All kinds of acorns are edible.) They broke open a few as they collected and sampled them for bitterness but came to no conclusions about which might be tastiest. As they walked the streets, many folks stopped them, curious and full of questions. David and Abraham were invited by strangers into their yards to collect nuts. They ended up bringing home acorns of many sizes from a variety of trees. While we have read that some people leave their acorns out to dry before cracking them, we were too excited and curious to wait. We sorted through the haul and discarded the few acorns with small round holes signaling that worms got them first. We then spent the rest of the afternoon listening to a book on tape while cracking acorns and removing the yellow meats into a bowl. By the time we were finished, it was getting late. We put the shelled acorn meats in an airtight container in the refrigerator. Due to a very busy week, we did not have time to continue processing them until the next weekend. 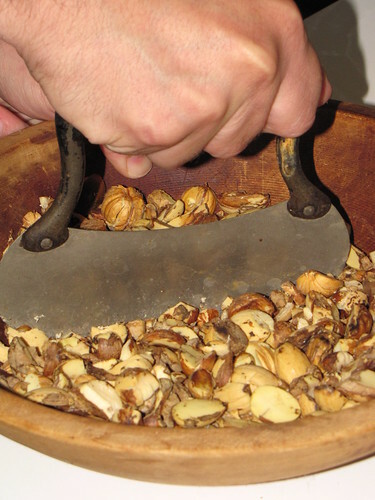 On the following Saturday afternoon, we pulled out David’s grandmother’s wooden bowl and mezzaluna and chopped the acorn meats into a coarse meal. Foragers without mezzalunas could pulse the meats in a food processor. All acorns contain tannins, some more than others. The tannins must be leached out of the acorns to make the meal palatable. 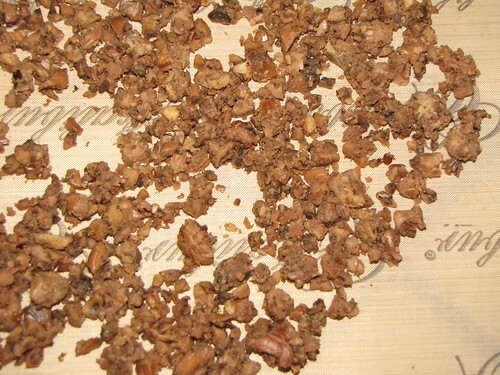 While we’ve heard that there are acorns in the West that are sweet, many East Coast varieties are high in tannins and quite bitter until they are leached. When we were finished leaching, we squeezed out as much water as possible from the bag of meal. We then spread the meal on a tray and put it in our dehydrator overnight. Other cooks could put the meal on a cookie sheet in a very low oven for an hour or so, or leave it overnight in an oven with the light on. 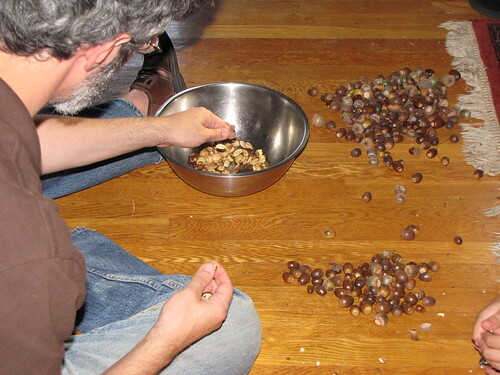 As an experiment, we didn’t chop a dozen acorns that we had managed to remove intact from their shells. We planned to make "acorn glace" from Stalking The Wild Asparagus. 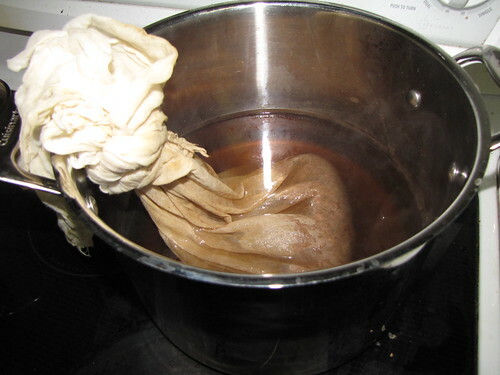 We leached the whole acorns in the boiling water (using the same process that we followed with the meal but without the cheesecloth). 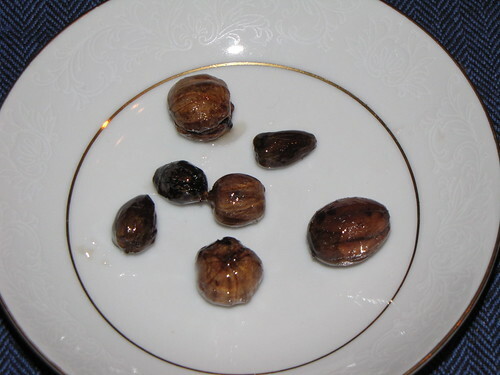 After fishing the nuts out and letting them dry on a plate, we roasted them in a hot oven (400 degrees) for twenty minutes or so until they were dry and toasty. We then dropped the toasted nuts into a warm simple syrup solution (1 pt water and 2 pt sugar gently boiled), let them stew for a few moments, then let them dry. 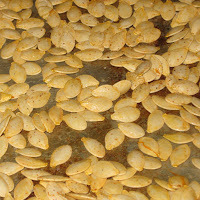 When we took the trays of meal out of the dehydrator the next morning, the warm acorn meal had a sweet and nutty aroma. It now had only a very slight bitterness, about as much as black tea. 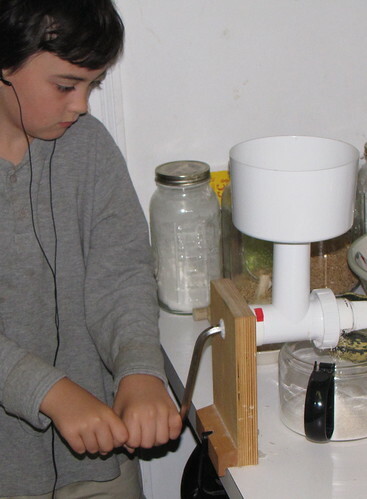 We put the dried meal in our hand-cranked grain mill. If you don’t have a mill, you could use a food processor to grind the meal into flour. Because it is a fresh whole flour, acorn flour does not keep for very long. If you want to hold it for a few days, put the flour in an airtight container in the refrigerator. 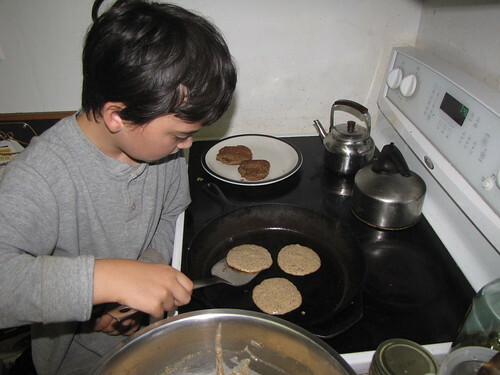 David and Abraham mixed the batter together and had pancakes on the griddle by the time I came down for breakfast. 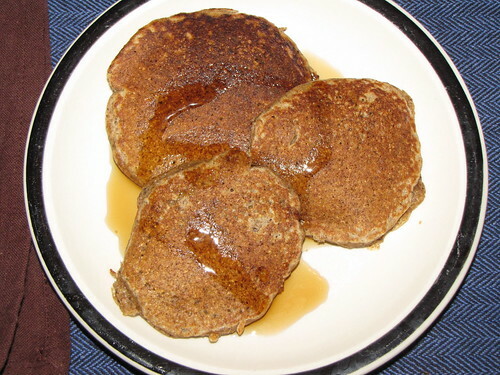 We served them with local maple syrup. They were delicious--with a slightly nutty, slightly earthy flavor. We had so much fun that we are already collecting more acorns for our next feast. 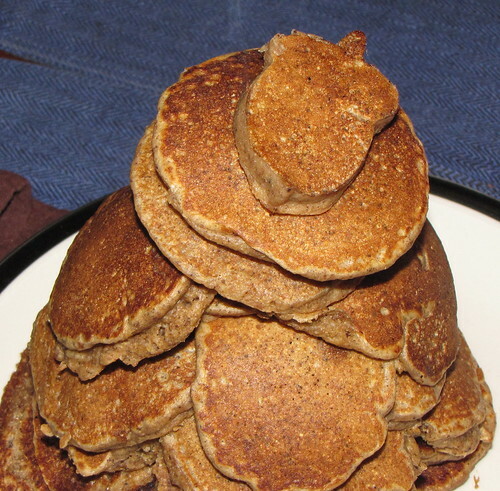 Next up: we’re going to try mixing acorn flour and our homegrown corn meal to make johnnycakes. We’ll let you know how it goes! Photo courtesy of regular guest poster, Sweet Eventide. The economic downturn has impacted many of us. Americans are spending less and saving more. Well, most of them are. The delightful blog, Small Notebook: Encouragement for a Simple Home, though recently published Three Great Ways to Spend More Money. The list was so right on that it had this frugal diva pulling out the ole eco-credit card. I'll give you a hint as to what was on Small Notebook's list. Healthy food. Not everyone agrees, apparently, that we Americans should be spending more to eat better. Over at Food Politics, Marion Nestle notes that, despite the White House garden and farmers market, not all of Washington is behind alternative agriculture. Industrial agriculture is pushing back. 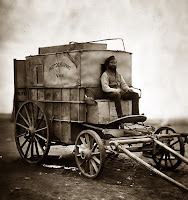 Still, some recognition for the new form of farming came in the way of a Nobel Prize for victory gardens . . . sort of. Red White & Grew highlights the recent award given to Elinor Ostrom who worked to show that people can share community resources a la yardsharing or community gardens. And remember last week when I debated starting the Great American Apparel Diet? Well, the latest line of shoes from my favorite shoe company may have changed my mind. I've long loved Simple Shoes. They manufacture their shoes with recycled and organic materials. They package them as minimally as possible. Treehugger reports that, in addition to all those attributes, they now offer a line of shoes that will biodegrade - even in a landfill! Now that's some good dirt! Between Blog Action Day, organizing the October APLS Carnival, and trying to get a glue stick recycling program in place at the kids school, I've used all of my available brain cells this week. 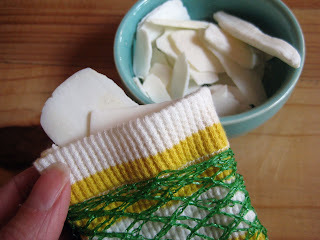 The Amazing 100% Repurposed Super Scrubby! I'm so completely rad sometimes. I've been trying for awhile to get used to hand knit dish scrubbers and a bamboo pot scraper, but my faithful Scotch-Brite keeps weaseling his way back into my kitchen sink. Darn him! So I was searching for something under the sink the other day and ran across a few of those mesh bag things that potatoes come in. I have three of them that I've been saving forever since they can't be recycled. The light bulb went on. 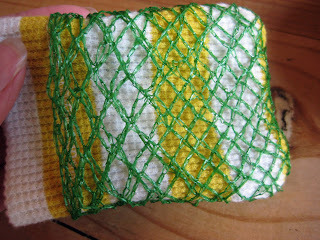 It was actually like a really cool movie with flashes of mesh bag to rag pile to soap ends. Ding, ding, ding! With 5 whole minutes left before I had to pick the kids up from school I rushed to the sewing machine with the mesh bag and a shirt my daughter had accidentally cut a huge whole in several months ago. 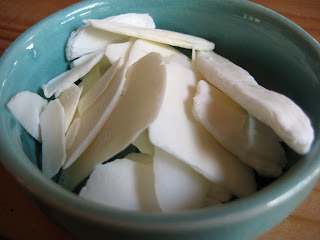 After a few quick turns on the sewing machine I grabbed the bowl of soap bits I'd been planning to grate for laundry soap. This was going to be so much better. ...and you have 100% repurposed dish washing bliss. I excitedly told this story to my husband, while washing our pot from dinner and showing him how amazing my invention truly was. It was kind of infomercial-esque. "Wow babe. You are.......something else." I think he's jealous of my innovative genius and superior crafting skills. Or....he's wondering why he married such weirdo. Guest writer Jaime included a garden on her her list of green resolutions this year. Determined to plant even though she couldn't swing a "proper" garden, she learned a few things from the butter beans and the squash. This time last year, I was reading Organic Gardening magazine every spare second I had. I was googling “square-foot gardening” and bookmarking web sites that had planting calendars for my zone. When spring arrived, I was overwhelmed by my scattered gardening notes and lists of companion plants. 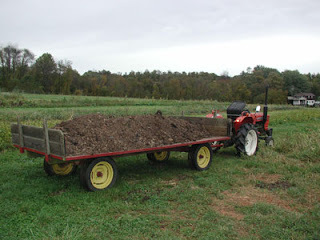 I was frustrated because my husband and I didn’t have the money to invest in raised beds, and we didn’t want to plow up half the yard because we weren’t positive we’d stay in our current house long-term. I was also nervous because I didn’t know what I was doing, but — despite all the reasons I had not to do so — I downloaded the catalog from Seed Savers Exchange. I ordered my seeds and the gardening lessons began. 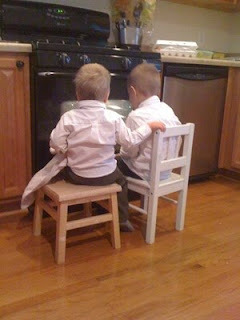 Lesson #1: It helps to have great helpers. #2: Sometimes great helpers are not such great helpers. My little helper pulled up all of my tomatoes started from seed. Do not start tomatoes from seed if you do not have a good sunny window that is off-limits to children that like to play in the dirt. #3: My other helper has been known to weed-eat wildflowers that would have attracted pollinators. #4: Beans are easy, especially if you already have a fence for them to grow on. They are also rather pretty! #5: If you have a weed-eating-happy helper, you should only plant beans that self-pollinate. My runner beans did not self-pollinate. I never got more than 5 beans at a time. #6: It takes a LOT of bean plants to get enough beans to can. We ate rattlesnake beans and lima beans all summer, but I never had enough to can. #7: Carrots are pretty easy, too. But it is hard to know when to dig up a root veggie. I pulled up several carrot slivers too early. #8: Carrots can be mighty funny looking. #10: Tomatoes are pretty easy, too. But good grief, how many plants do you need to get enough tomatoes to can them? I had six tomato plants and one cherry tomato plant — all given to me by a kind neighbor and wonderful grandparents who got carried away buying seedlings! I honestly expected to be canning all summer. I think I got more tomatoes from my one plant last year. I don’t know if I had the wrong varieties this year, if I should blame the crazy weather, or if the plants did not get enough sun. At any rate, they were delicious while they lasted, and I have quite a few frozen and ready for soups and chili this winter. #11: It is awesome to walk into your backyard and eat a freshly picked, oh-so-sweet strawberry. #12: It is heartbreaking to hand the only strawberry of the day to a toddler who will accidentally step on it after running around with it for 20 minutes trying to decided if he should taste it or not. #13: Strawberry plants are rather pretty, too. #14: If you go out of town for the weekend just before the blueberries ripen, the birds will feast well before you return. #15: Sometimes you have to stop waiting for the fruits to get to the size described on the seed packet. Hence, you will pick apple-size watermelons in mid-October. #17: Same goes for crooked-neck squash and cantaloupe. #19: You’ll never know unless you try. Just dig a few holes and plant some seeds or seedlings. See what comes up, see what bears veggies! I may not have had the most successful first garden but it really was that easy after I quit stressing about doing everything "right." #20: The sooner you start, the sooner you will reap harvest. Even though we are not sure we’ll stay here long-term, I am so glad we got blueberry and strawberry plants because they will produce more each year. Now to get a few apple trees…. Next up, lessons from my first orchard! What did you learn from your garden this year? Back in the days BK (before kids, that is) the Mister and I rocked lots of concerts and shows. I used to call all of those service charges and taxes they added onto the price of tickets "inconvenience fees". For the ease of going online and buying tickets, rather than going to a ticket outlet, they charge you an exorbitant fee that they called "convenience charges". My wallet would probably beg to differ. Now, 8 years and 3 kids later, we rarely go to concerts anymore (unless a singing Disney character is involved). We live a much different, simpler lifestyle, recognizing the enormous convenience fee called Climate Change that Mother Nature has put upon us for all of the things we think are supposed to make our lives easier. From bottled water to genetically engineered Roundup resistant crops, the things we've produced in the name of convenience come with much larger charges than concert tickets do. Climate change is no inconsequential charge that we can shrug and accept, which is why we do what we do here at the Green Phone Booth. Sure, I may sew, craft and give handmade gifts because of the creative outlet and satisfaction it provides me. Green Bean may garden for the taste of fresh heirloom tomatoes and the feel of dirt under her nails. But at the root of almost everything we do is climate change. When I sew a bag for a girlfriend for her birthday, I put my own creativity into finding the right fabric (thrifted or repurposed) and creating the perfect gift just for her. No pesticides are used to grow cotton to make new fabric. I relieve a young girl in China from having to make a bag for me for an unfair wage in a factory spilling pollution into the air and groundwater. A bag never has to be shipped from China to the US, then driven cross-country to get to me. I started doing things like this in the name of climate change and reducing my carbon footprint, but I continue doing them because it's a simpler way of life that I enjoy immensely. Another bonus? I don't have to work as hard to be able to afford the things that are supposed to make my life easier. Novel idea. Participate in events like today's Blog Action Day to show others how important climate change is to you. Participate in the International Day of Action and help 350.org show our leaders just how many people are unified for this cause. Call your representatives. This video from the World Wildlife Fund and its Act For Our Future campaign shows you just how painless it is to call your Senator and ask him/her to vote YES on climate legislation. Seriously, it takes less than one minute. Finally, share your ideas. Leave us a comment. Let us know that you've called your Senator and what else you're doing (or plan to do) as a collaborative action against climate change. 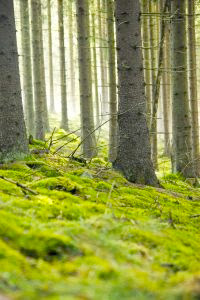 Are You an Effective Green Missionary? Take the Quiz and Find Out! A quiz from the Conscious Shopper for this month's APLS Carnival. Read more about "proselytizing green" on October 19 at the Greenhabilitator's personal blog, Greenhab. Taking a hint from girlie magazines, I've prepared a little quiz to help you figure out what kind of green missionary you are. Good luck! a) tell her, "That is so disgusting! How can you eat that!" b) don't say anything then, but later you tell her, "I read an awesome book called Fast Food Nation. Would you like to borrow it sometime?" c) pat yourself on the back for making smart choices about your health and the health of the planet. a) make your friends feel guilty for having a car every chance you get. b) ask a friend if he wants to go on a bike ride with you this weekend. c) notice how much healthier you feel and think how great it would if more people would give up their cars. a) say to your friend, "These people are idiots! Where I'm from, we..."
b) help your friend brainstorm ways to make his city greener. c) are relieved when you finally get back home to your recycling bins and good public transportation. a) reprimand your host for being wasteful and demand that she replace the paper and plastic with her regular dinner dishes. b) pull out your wrap-n-mat and to-go ware, leading to lots of questions, which you pleasantly answer. c) accept the paper and plastic to avoid hurting your host's feelings but go home with a healthy serving of eco-guilt. a) describe every detail of the movie and get so into your explanation that you don't notice your co-worker's eyes glazing over. b) tell her you went to an interesting documentary about where our food comes from and ask if she'd like to go see it with you next weekend. c) tell her, "Nothing much," because you don't want to be labeled the eco-freak in the office. a) write a long and detailed letter to the principal, your child's teacher, and the PTA reprimanding them for their wasteful behavior. b) contact the PTA and offer to head up a recycling program. c) pack a waste-free lunch for your child and hope that other parents will start doing the same. a) engage in a heated discussion with him on Facebook. b) remind your friend that there are many reasons to live an eco-friendly life even if we're wrong about climate change, and then respectfully agree not to talk about that subject anymore. c) decide to end that friendship. For each question that you answered (a), give yourself 1 point. For each question that you answered (b), give yourself 2 points. For each question that you answered (c), give yourself 3 points. What kind of green missionary are you? If you scored between 7 and 9 points, you are a Green Zealot. 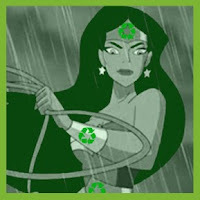 You are committed to living a green lifestyle, but your aggressive and sometimes judgmental attitude can be a turn-off. Lighten up a little, and you'll convince more people to go green. If you scored between 10 and 16 points, you are EnviroBalanced. When the situation calls for it, you're not afraid to stand out, but you try not to be too pushy. Keep being a green example and showing your friends the benefit of living an earth-friendly lifestyle, and pretty soon you'll be surrounded by greenies. If you scored between 17 and 21 points, you are Eco Shy. You feel good about the green choices you've made, but you don't like to stir the pot or attract attention to yourself. Don't be afraid to step outside your comfort zone now and then, and you'll see more success in spreading the green message. While our American Thanksgiving holiday is still a good month off, our German-speaking community celebrated "Erntedank" (literally: thanks for the harvest) last weekend. As I gathered ideas for Thanksgiving activities for the TruffulaBoyz, it struck me that these centered primarily around taking from the rich array of edible goodies around us and saying "thank you" for them. We were invited to donate non-perishibles to a local food bank, and filled a bag with items to share. Of course, that's all nothing earth-shattering, right?! Something was missing, though I couldn't quite put my finger on it... How could you go wrong with giving thanks for what you've been given and sharing with those who have less? My missing link started to emerge... Thankfulness alone doesn't cut it. Unlike in the Grimm's fairy tale, our tables don't spread themselves. That is, fertile soil will certainly produce miraculous harvests for a while. After some time, though, the jig is up, and even the richest soil will wear out. If however, we support the soil, replacing the necessary constituants -- or better yet, not depleting them in the first place -- then the fields (or plots, or rows, or containers, depending on our scale) can continue to bless us with their gifts. And sure enough, when the TruffulaBoyz and I went out to volunteer at our CSA two days later, one of our tasks was to help spread compost. 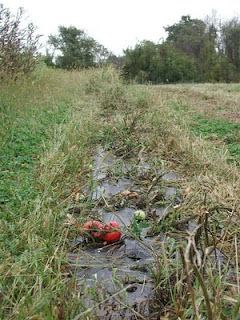 That compost went onto a field which had sported row upon row of all sorts of tomato plants all summer long. The rows had yielded tomatoes of all colors and sizes, and you should have seen how many went home in each share! Only that morning, the shriveled plants had been removed, their stakes pulled out, and the row-covering plastic taken away. Oh, how we are thankful for the tomato bounty (especially those Sun Gold cherry tomatoes! ), and the other beautiful and tasty gifts the CSA, my own garden, and other sources have given us this past year! And out of that gratefulness, we are also thankful for the rich compost mixed into that naked soil. With the compost, added shovel by shovel, plowed under, the tomato rows are ready to receive the garlic cloves coming in over the next few weeks. 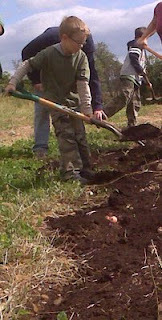 Sustainable taking requires giving back... supporting the soil which supports us is but one example. Where else can I, can you, can we give thanks just a little differently this year? How can we better support our communities, our friends, our families, and -- dare I bring it up? -- ourselves by returning something to that which keeps the bounty going? There's been a lot of news lately about Climate Change. Some of it is good (kind of sort of if you're squinting and crossing your fingers really hard. Apparently, we still have a 50/50 chance of not wiping out our entire species. Woohoo! Some of it is not as good. Twenty-five of our most beautiful, most celebrated National Parks are in grave danger due to Climate Change. Many of my favorites were on this list. What's a girl to do when faced with news like that? Only its not the kind of diet you think. I'm thinking of The Great American Apparel Diet. It began with 18 women vowing not to buy anything new for 1 year. There's no counting calories but you do have to exercise plenty of your restraint and imagination. Are you up for the challenge? The rules look pretty straightforward . I just might be ready to take the plunge. Reinventing your wardrobe is just one way to get creative in the reuse category. The awesome looking magazine Green Craft (found via Green Moms Carnival buddy Mindful Momma) looks to have loads more ideas. Now if I can just get my hands on a copy! Thats not the only really interesting-looking (yes, I've not seen this one in person either) magazine to pop up. How cool does Urban Farmer (found via Garden Rant) look. Me really really want a copy! Speaking of urban farming, my garden isn't much to look at though, these days. The tomatoes are mostly dead as are the pumpkin vines. I pulled out the watermelon already and its down right spooky out there. Perhaps its time for a Garden Graveyard just in time to scare off the trick or treaters because I haven't gotten around to getting them their fair trade, organic chocolate yet. This talk of chocolate reminds me that I really want to make this instant hot cocoa recipe from Towards Sustainability. I haven't done that yet but I have baked every recipe under the sun that relates to apples this past month. These are the best apple recipes I've tried. My Baking Addiction featured the absolute best Apple Bar recipe (a variation of the one from All Recipes). I doubled the recipe and left off the cream cheese frosting. Totally fat free I'm guessing, without all that frosting. Shhh. Don't tell me otherwise! I just finished the last bar. I was equally smitten with the recipe for Jewish Apple Cake from the Smitten Kitchen. So superb it didn't last a day in my house. Her Whole Wheat Apple Muffins weren't too shabby either. Oh, gotta run. That oven timer is beeping. I've been drooling for weeks over this Pumpkin Pie from a real pumpkin recipe that was posted over on Make it From Scratch. I LOVE autumn - the sights, sounds, smells and, especially, the tastes. Surprisingly I've never made a "real" pumpkin pie before. It seems a little daunting to turn a pumpkin into a pie when I can just buy it half way done in a can. But this year is different! 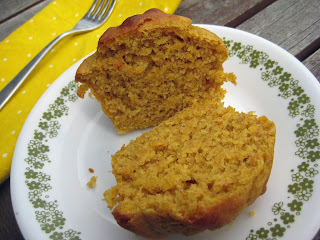 I'm trying new things on the cooking frontier and, since pumpkin is my favorite fall flavor, I decided I'd need to try my hand at my own pumpkin puree. Can I just tell you that I'll never buy pumpkin in a can again? I'm no foodie and I'm usually a pretty bad cook, but this was easy-peasy-rice-and-cheesy! If you've ever made your own baby food, it's nothing more than that. Buy a small (3-5 lb) pie pumpkin. Not a jack-o-lantern pumpkin!! 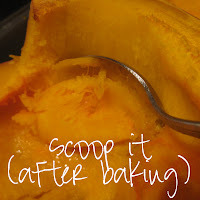 Wash it, cut it in half, scoop out the stringy part and the seeds. Set the seeds aside for toasting! Fill your pan with about 3/4" or so of water. Put the cut sides of the pumpkin down. 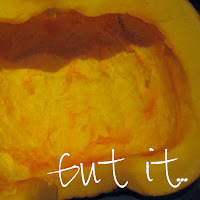 When it's done, scoop out the pumpkin, and puree it. I used Oskar, my 1973 food processor. He's the best. That's it. 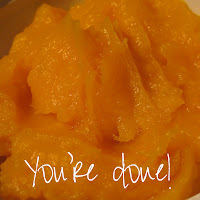 You have pumpkin puree! Why in the world would you buy the preservative-laden, BPA-lined canned version ever again? I kept some in the fridge for immediate baking (see below) and I froze some in 1 cup increments. I got about 6 cups worth out of one pumpkin that I'm guessing was about 4-5 lbs. I didn't weigh it because they were just a set price at the farmer's market. Macy brought them to school for Show & Tell. The theme was "Bring in something that shows it's fall." 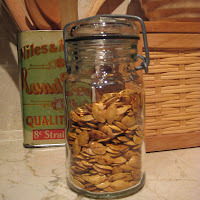 Toasted pumpkin seeds say fall to me! 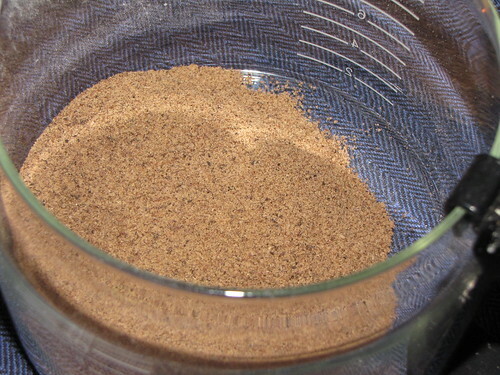 Mix dry ingredients together very well. Beat egg in a large bowl, then add other wet ingredients to it. Mix. Pour wet mixture into dry mixture and combine well. At this point, if it feels extremely thick, you can add a splash more of milk. 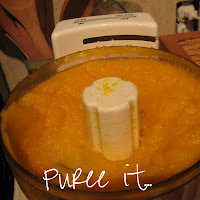 Some pumpkin purees are very wet, others aren't, so you might need the extra moisture of a little added milk. Add a splash at a time, but probably no more than 1/4 cup. Spoon into greased cupcake pan. Bake at 400 degrees for 20 - 25 minutes, or until golden brown. These are what I think of as "grown up" muffins, meaning they're not really sweet. They'd also be good with cranberries or raisins and nuts in them. I'm making muffins in lieu of cupcakes for Macy's Kindergarten Halloween party so, for kid-appeal, I'm planning to add some chocolate chips and top with a cream cheese frosting. I love this Pumpkin Spice Cream Cheese Spread that I found from Pinch My Salt last year, but not sure if it will be a home run for the kids. (It definitely is for me though - deeelish!) Maybe I'll add a square of baker's chocolate when I make it. Kids love anything chocolate, right? If you have any recipes for healthyish muffins I can pass off for cupcakes to a group of 5 year olds, I'm all ears!